In the final annual New Year’s Poetry Reading Ceremony before his abdication, Emperor Akihito reflected Wednesday on sunflowers, which have become associated with a major earthquake in the nation. The choice of topic has been said to indicate his ongoing commitment those affected by the disaster. 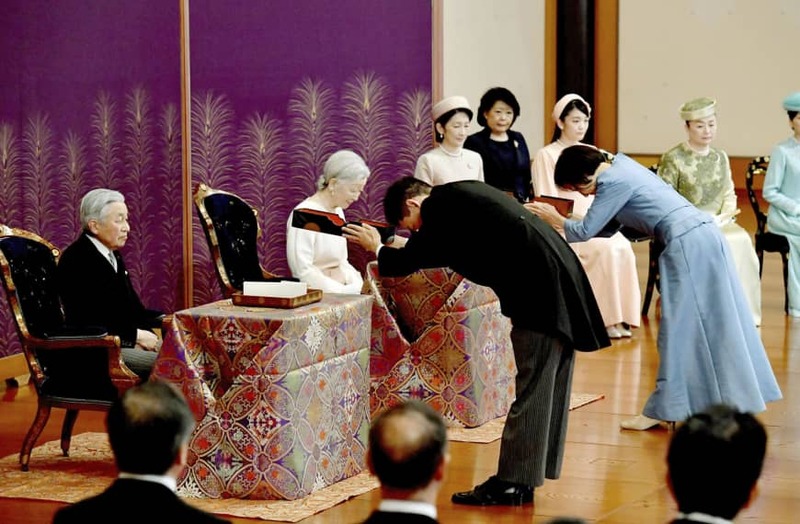 The 85-year-old Emperor is scheduled to retire on April 30 as the first living Japanese monarch to do so in about 200 years, ending his reign and the Heisei Era. His son Crown Prince Naruhito will succeed him the following day. This year’s theme for waka poems at the reading ceremony, which was held at the Imperial Palace, was hikari, meaning light. The Emperor and Empress Michiko, who have visited disaster-hit areas together over the years, are not expected to compose poems for future reading ceremonies. In his poem, the Emperor described how sunflowers that have become a symbol of remembrance and reconstruction have thrived following the magnitude 7.3 quake in 1995 that claimed the lives of more than 6,400 people in western Japan. In the early summer light. The Imperial Couple were given the seeds of “Haruka’s Sunflowers,” named after 11-year-old Haruka Kato who was killed in the Great Hanshin Earthquake on Jan. 17, 1995, on the 10th anniversary of the disaster. They planted them in the garden of the Imperial Palace in 2005. They continued to grow the sunflowers each year by planting seeds taken after the flowering season, according to the Imperial Household Agency. The sunflower seeds have since been distributed to many parts of Japan, including areas affected by the Great East Japan Earthquake on March 11, 2011. The Emperor has regarded visiting people facing hardships as the role of an emperor who is a “symbol of the state,” and has regularly traveled to disaster-hit areas to console those affected. A senior official at the Imperial Household Agency said the feelings of the Emperor and Empress for those in the affected areas will remain the same even after the Emperor’s abdication. “The poem recited at his last reading ceremony reflects such resolve,” the official said. In her poem, Empress Michiko, 84, reflected on the moment of quiet joy and serenity she felt as roses bloomed in the garden of the Imperial Palace, easing the worries that have come with aging. In the waning light of dusk. 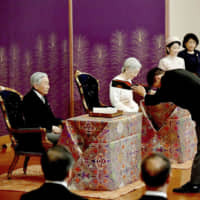 Japan passed one-off legislation to enable the Emperor’s abdication after he expressed his desire to step down in a rare video message aired in August 2016, citing his advanced age and weakening health. The English translation of the two poems was provided by the Imperial Household Agency. The Imperial Couple’s poems, as well as works composed by other members of the Imperial family and 10 pieces chosen from 21,971 entries from the public, were recited in the traditional style at the reading. Crown Prince Naruhito reflected on the memories of seeing sunlight shining through clouds as he was climbing Mount Kimpu, straddling Yamanashi and Nagano prefectures, as a high school student. Crown Princess Masako depicted the morning light shining on white birch at the Crown Prince’s residence. The princess did not take part in the ceremony as she has developed symptoms of a cold. Waka poetry was developed by the court aristocracy in the sixth century. Tanka poems, typically synonymous with waka, consist of 31 syllables in a pattern of 5-7-5-7-7. The agency said it will announce the theme for next year’s New Year’s Poetry Reading ceremony after Crown Prince Naruhito ascends to the throne on May 1. He will decide the theme as the host of the reading. The theme of the following year’s poetry is normally announced on the day of the reading.